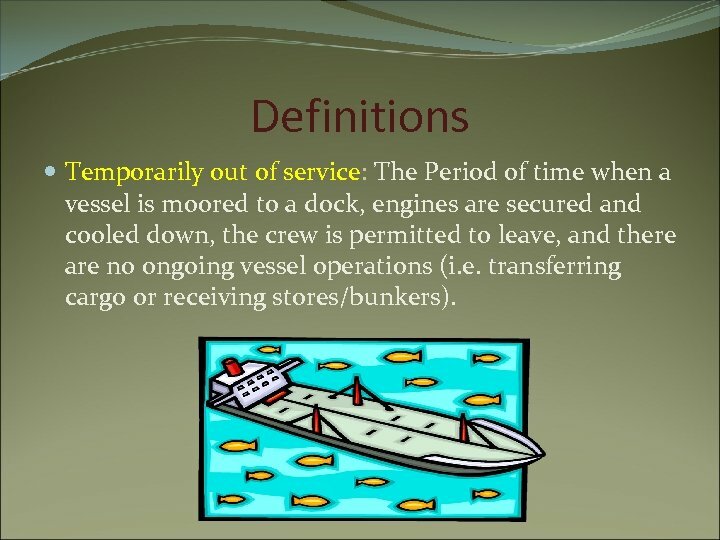 Definitions Temporarily out of service: The Period of time when a vessel is moored to a dock, engines are secured and cooled down, the crew is permitted to leave, and there are no ongoing vessel operations (i. e. transferring cargo or receiving stores/bunkers). Laid-up vs. Temporarily out of Service The term laid-up is used along with the words “dismantled, or otherwise out of commission” in 33 CFR 104. 110(b). A vessel that is permanently “laid-up, dismantled, or out of commission” would be one that has surrendered its Certificate of Inspection (COI) or no longer has a valid Certificate of Documentation. 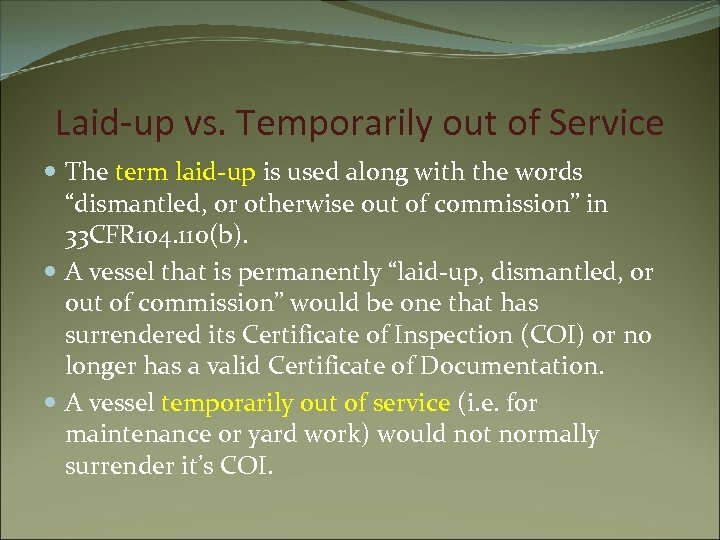 A vessel temporarily out of service (i. e. for maintenance or yard work) would not normally surrender it’s COI. 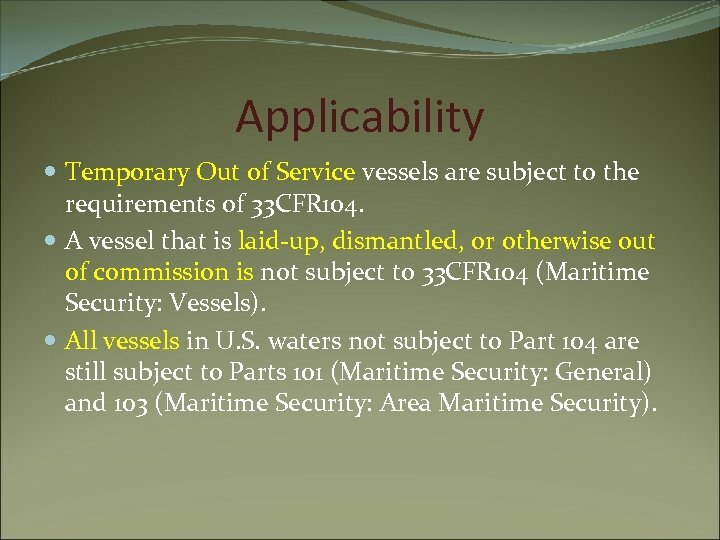 Applicability Temporary Out of Service vessels are subject to the requirements of 33 CFR 104. A vessel that is laid-up, dismantled, or otherwise out of commission is not subject to 33 CFR 104 (Maritime Security: Vessels). All vessels in U. S. waters not subject to Part 104 are still subject to Parts 101 (Maritime Security: General) and 103 (Maritime Security: Area Maritime Security). Training Purpose? 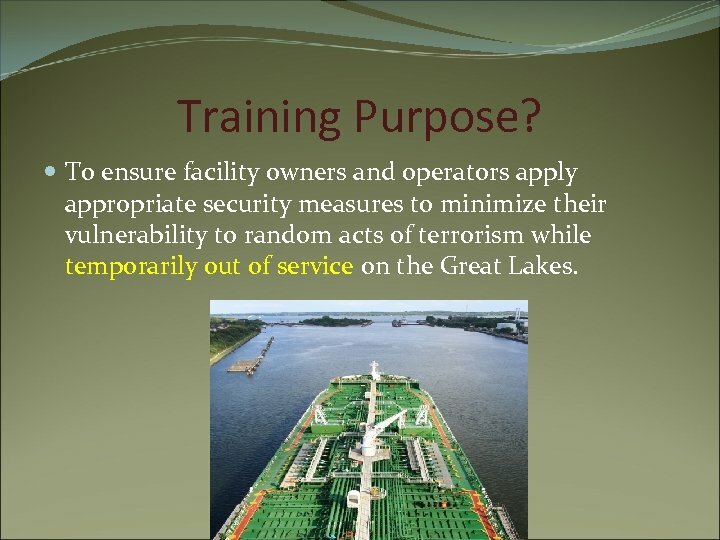 To ensure facility owners and operators apply appropriate security measures to minimize their vulnerability to random acts of terrorism while temporarily out of service on the Great Lakes. 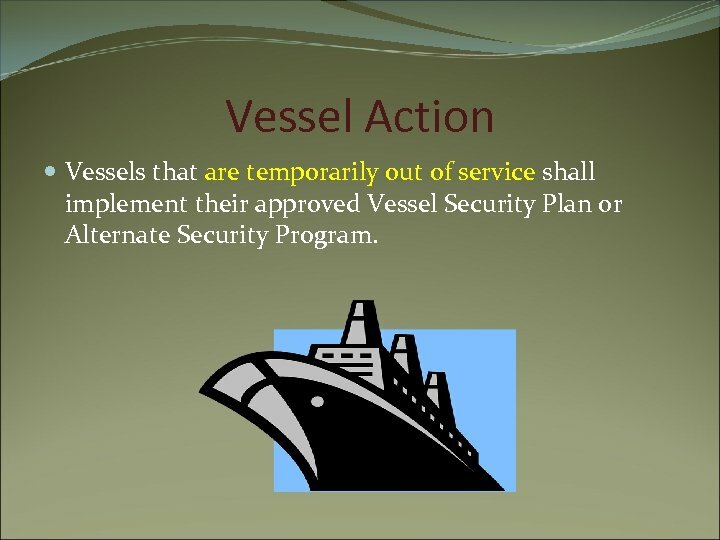 Vessel Action Vessels that are temporarily out of service shall implement their approved Vessel Security Plan or Alternate Security Program. Facility Action A facility regulated under 33 CFR 105 that intends to receive a 104 regulated vessel that is temporarily out of service shall implement its security plan while vessels are moored at the facility. 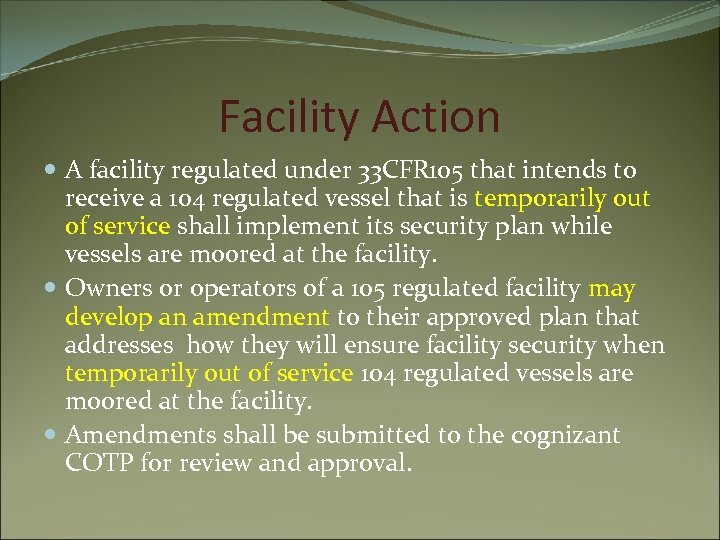 Owners or operators of a 105 regulated facility may develop an amendment to their approved plan that addresses how they will ensure facility security when temporarily out of service 104 regulated vessels are moored at the facility. Amendments shall be submitted to the cognizant COTP for review and approval. Facility Action (cont. ) 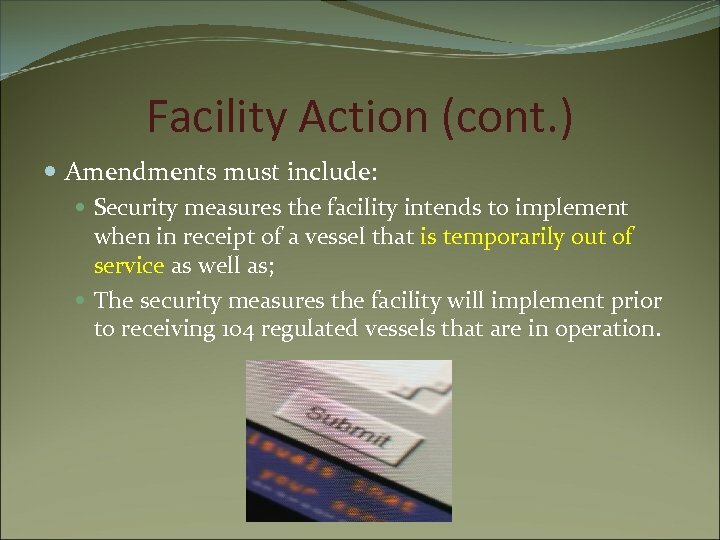 Amendments must include: Security measures the facility intends to implement when in receipt of a vessel that is temporarily out of service as well as; The security measures the facility will implement prior to receiving 104 regulated vessels that are in operation. 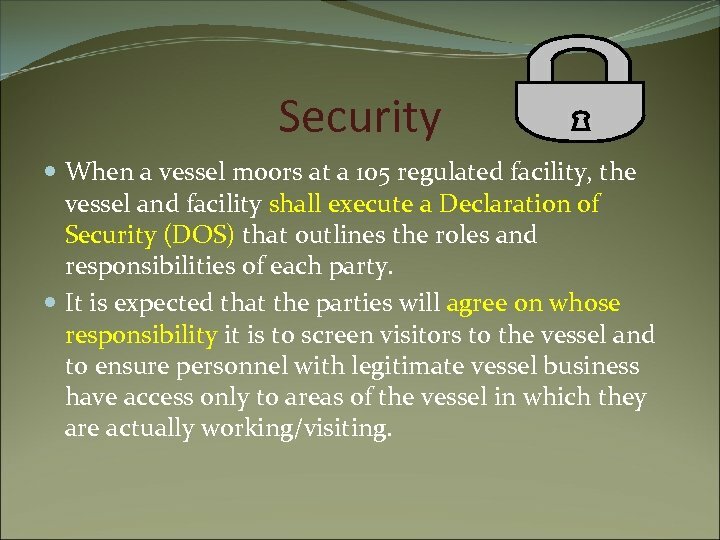 Security When a vessel moors at a 105 regulated facility, the vessel and facility shall execute a Declaration of Security (DOS) that outlines the roles and responsibilities of each party. It is expected that the parties will agree on whose responsibility it is to screen visitors to the vessel and to ensure personnel with legitimate vessel business have access only to areas of the vessel in which they are actually working/visiting. 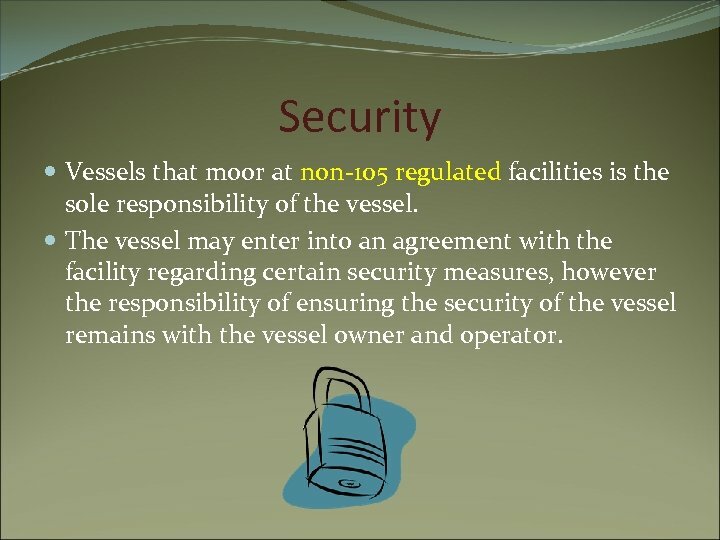 Security Vessels that moor at non-105 regulated facilities is the sole responsibility of the vessel. The vessel may enter into an agreement with the facility regarding certain security measures, however the responsibility of ensuring the security of the vessel remains with the vessel owner and operator. 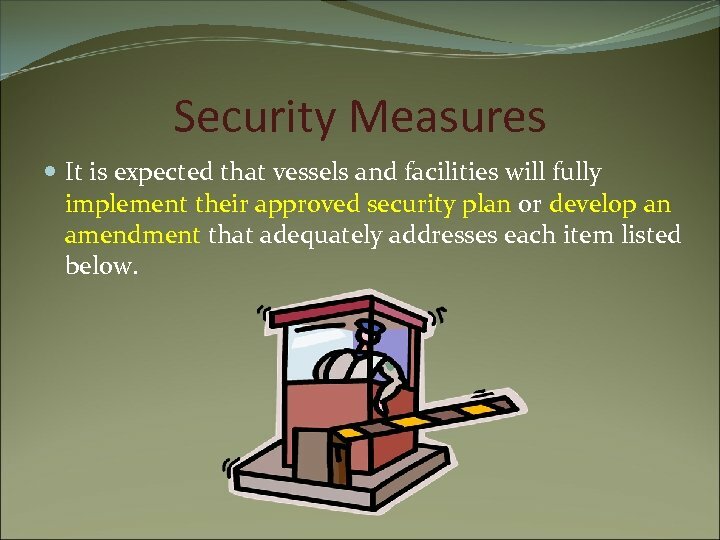 Security Measures It is expected that vessels and facilities will fully implement their approved security plan or develop an amendment that adequately addresses each item listed below. Security Measures (cont. ) 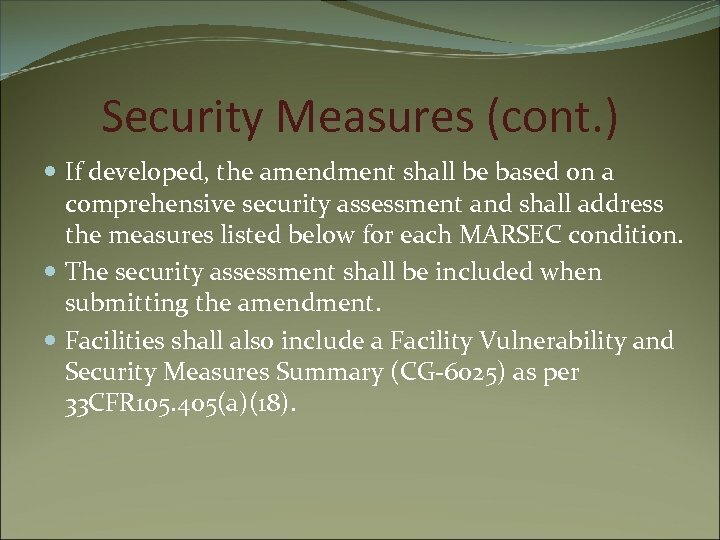 If developed, the amendment shall be based on a comprehensive security assessment and shall address the measures listed below for each MARSEC condition. The security assessment shall be included when submitting the amendment. Facilities shall also include a Facility Vulnerability and Security Measures Summary (CG-6025) as per 33 CFR 105. 405(a)(18). (1) Security Measures for Access Control Procedures to validate the identity of personnel intending to board the vessel or enter the facility. 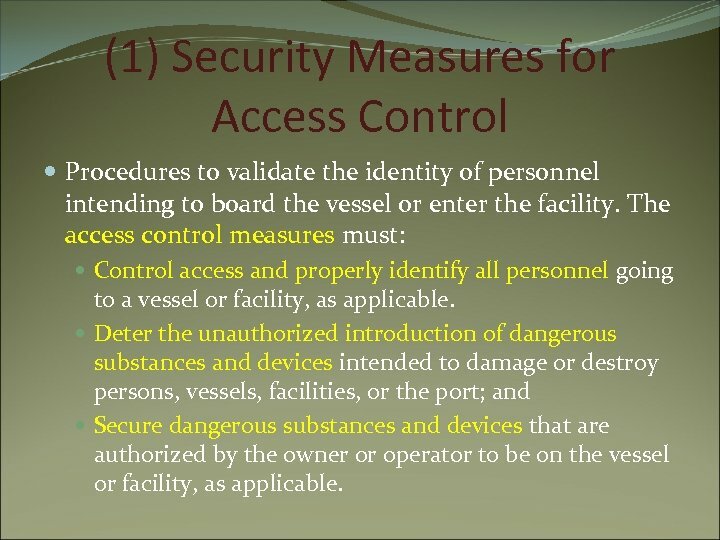 The access control measures must: Control access and properly identify all personnel going to a vessel or facility, as applicable. Deter the unauthorized introduction of dangerous substances and devices intended to damage or destroy persons, vessels, facilities, or the port; and Secure dangerous substances and devices that are authorized by the owner or operator to be on the vessel or facility, as applicable. 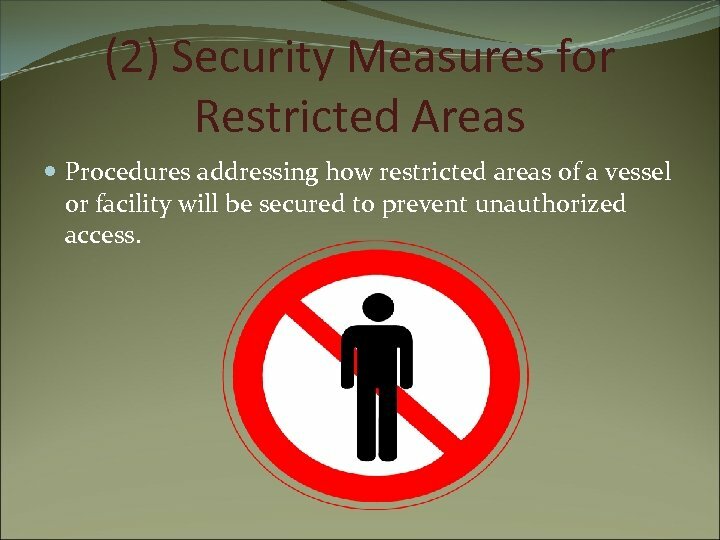 (2) Security Measures for Restricted Areas Procedures addressing how restricted areas of a vessel or facility will be secured to prevent unauthorized access. 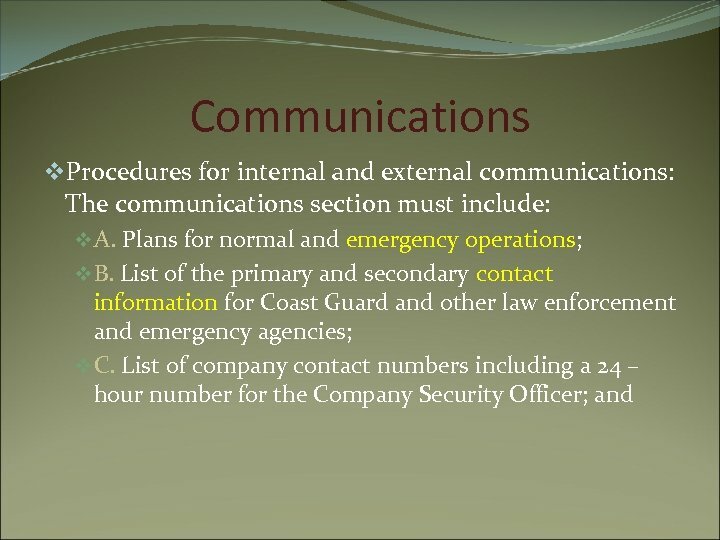 Communications (cont. ) v. D. A plan for how the security personnel will: v 1. Respond to security threats or breaches of security; v 2. Evacuate the vessel or facility in the event of a security threat or breach in security; and v 3. 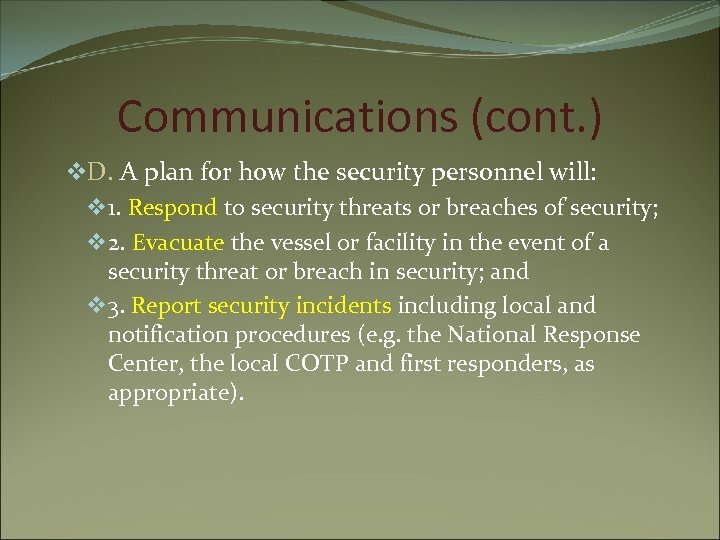 Report security incidents including local and notification procedures (e. g. the National Response Center, the local COTP and first responders, as appropriate). 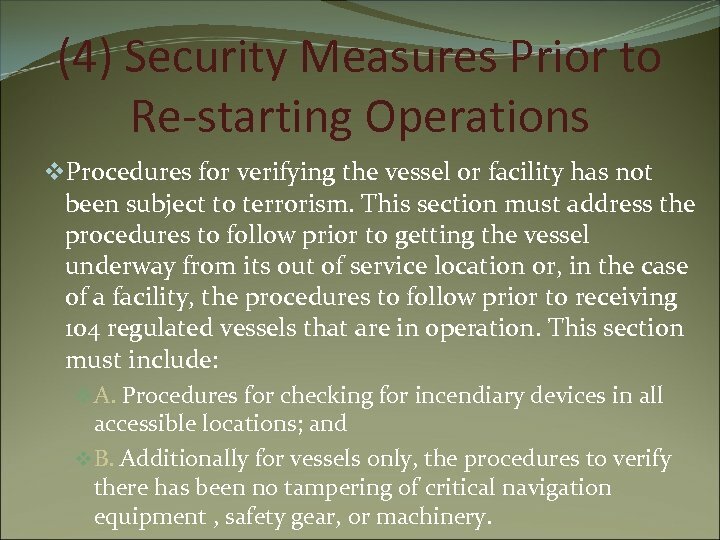 (4) Security Measures Prior to Re-starting Operations v. Procedures for verifying the vessel or facility has not been subject to terrorism. This section must address the procedures to follow prior to getting the vessel underway from its out of service location or, in the case of a facility, the procedures to follow prior to receiving 104 regulated vessels that are in operation. This section must include: v A. Procedures for checking for incendiary devices in all accessible locations; and v B. Additionally for vessels only, the procedures to verify there has been no tampering of critical navigation equipment , safety gear, or machinery. 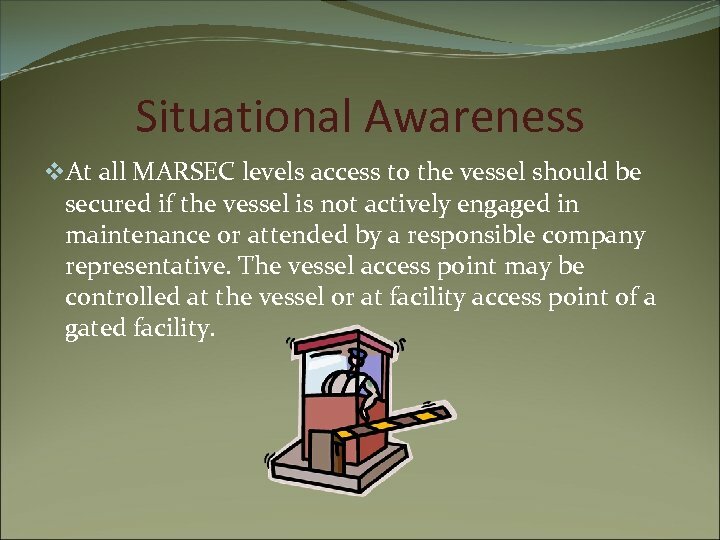 Situational Awareness v. At all MARSEC levels access to the vessel should be secured if the vessel is not actively engaged in maintenance or attended by a responsible company representative. The vessel access point may be controlled at the vessel or at facility access point of a gated facility. 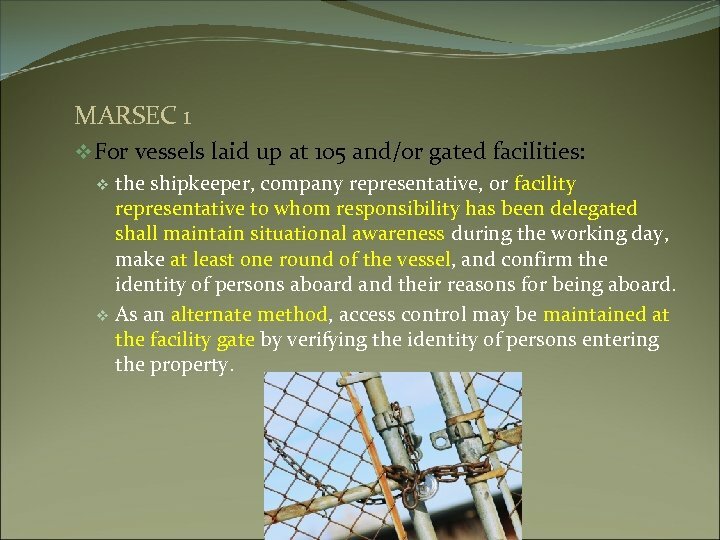 MARSEC 1 v For vessels laid up at 105 and/or gated facilities: v the shipkeeper, company representative, or facility representative to whom responsibility has been delegated shall maintain situational awareness during the working day, make at least one round of the vessel, and confirm the identity of persons aboard and their reasons for being aboard. v As an alternate method, access control may be maintained at the facility gate by verifying the identity of persons entering the property. 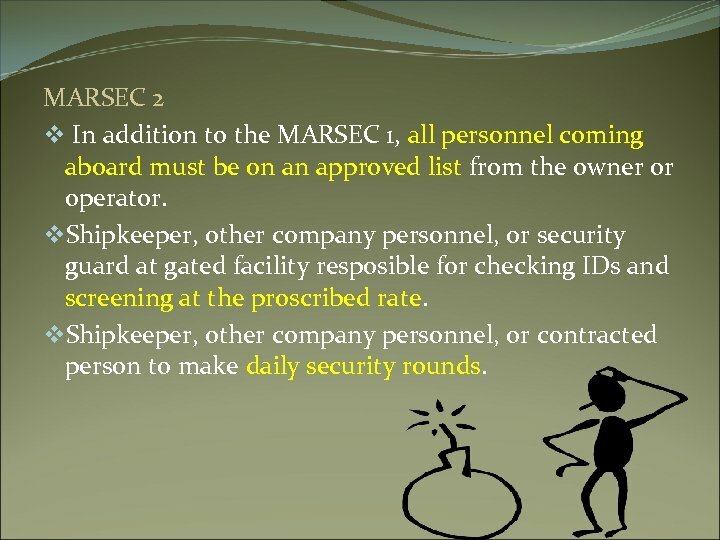 MARSEC 2 v In addition to the MARSEC 1, all personnel coming aboard must be on an approved list from the owner or operator. v. Shipkeeper, other company personnel, or security guard at gated facility resposible for checking IDs and screening at the proscribed rate. v. Shipkeeper, other company personnel, or contracted person to make daily security rounds. 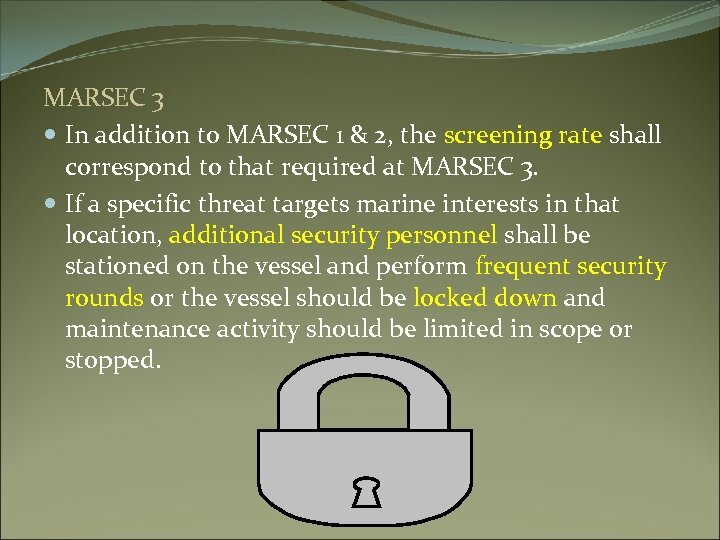 MARSEC 3 In addition to MARSEC 1 & 2, the screening rate shall correspond to that required at MARSEC 3. 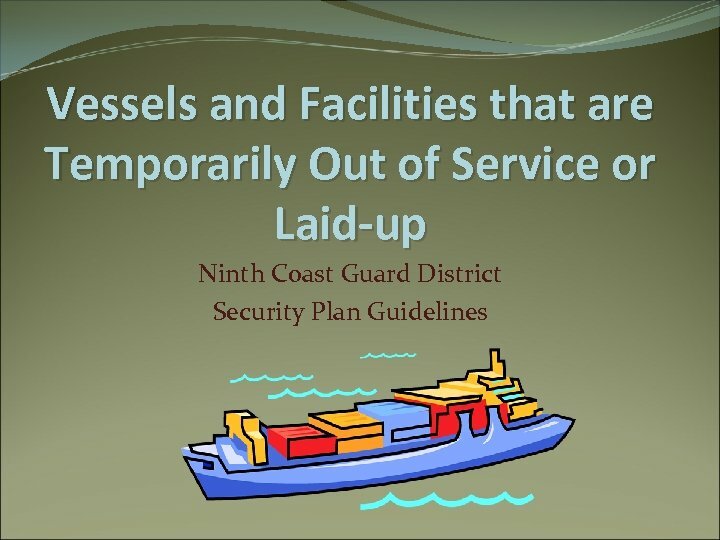 If a specific threat targets marine interests in that location, additional security personnel shall be stationed on the vessel and perform frequent security rounds or the vessel should be locked down and maintenance activity should be limited in scope or stopped.